METEOR RADAR: The US Air Force Space Surveillance Radar is scanning the skies above Texas. When a satellite or meteoroid passes overhead--ping!--there is an echo. Activity is picking up this week as Earth enters a stream of debris from extinct comet 3200 Phaethon, source of the annual Geminid meteor shower. Tune into Spaceweather Radio for live audio. Banbury continues: "It consisted initially of a green beam of light similar in color to the aurora with a mysterious rotating spiral at one end. 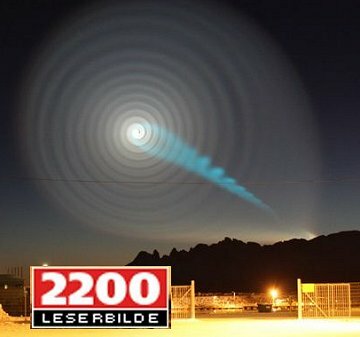 This spiral then got bigger and bigger until it turned into a huge halo in the sky with the green beam extending down to Earth. According to press reports, this could be seen all over northern Norway and must therefore have been very high up in the atmosphere to be seen hundreds of km apart." UPDATE: Circumstantial evidence is mounting that the phenomenon was caused by a malfunctioning rocket, possibly an ICBM launched from a Russian submarine. A Navtex no-fly alert was issued for the White Sea on Dec. 9th, and photographers appear to have recorded the initial boost phase of a launch below the spiral (see inset). A rocket motor spinning out of control could indeed explain the spiral pattern, so this explanation seems plausible, although it has not yet been confirmed. More reports and videos: #1, #2, #3, #4, #5. What's driving the surge? The source of the Geminids is extinct comet 3200 Phaethon. A stream of debris from the comet has been sweeping across Earth's orbit for more than a century, and we are plunging deeper into the stream with each December crossing. Computer models suggest that the Geminids will continue to intensify with meteor rates jumping another 20% to 50% in the decades ahead. Researchers will be watching the 2009 Geminids to see if the trend does indeed continue. Rates could exceed 140 meteors per hour when the shower peaks on Dec. 13th and 14th. Get the full story and observing tips from Science@NASA. On December 9, 2009 there were 1085 potentially hazardous asteroids.